If it has not been stated already, it is a magical sensation when the sun slowly fades down over the horizon and the caps of the waves glisten with beams of the sunset. Smells of the fresh water breeze fill your lungs as it sweeps across the harbor. Each step takes you past the park fill with families playing volleyball, friends playing tennis, kids playing in the labyrinth of wooden castles, and the elderly strolling along the shore with smiles as if it was their last chance. The time is at the end of summer where the weather is warm and the blistering heat has vanished. Even the swarms of gnats could not put a damper on this magical sensation. Getting here was no easy task. Well...to clarify, directions are simple from POP's Loose Moose Lodge, take the 37 to Traverse City, take the 31 to Mackinac Bridge, and take the 2. Only the extremely gifted at being directionally challenged could possible make a wrong turn, and that is most likely because they turned. Tens of thousands of gnats plastered the front of the bumper. 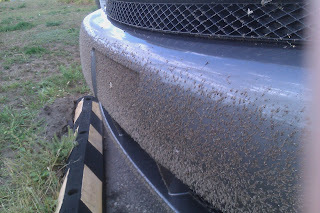 The majority of the gnats' grave is the greywater of the BP car wash down the road. However there are still gnats that are lingering around stuck in the crevices that are not so easy to reach.